So those who know me know that I'm normally a bit of a procrastinator. But in the past few months, in getting ready for the baby I've gotten much better at tackling projects. The crib, dresser, shelf, & night stand all got brought up from the car quickly AND put together almost right away. PLUS, I painted the nursery without being nagged... er... gently reminded by the wife. Now I needed to buy a new computer cart because we needed a different setup. You see the old computer desk was in what is now the nursery. So we had to get rid of it. When we got a refurbished computer a while ago I set it up on the counter of the breakfast nook attached to our kitchen. Friends of ours keep their Mac in the same spot & it works great for them. However, computer work areas accumulate stuff. Add a huge tower and a printer and now we really don't have a breakfast nook at all. The problem reached it's breaking point with the baby on the way. We don't want wires hanging down and easy to grab by little hands. But where to put it? We don't have room for a desk in our bedroom. And doing wireless keyboards, mice, & monitor would awkward expensive and just be one more hassle when it doesn't work right (which you KNOW is going to happen. Then genius struck: a computer cart! Of course I can't find any decent ones locally. 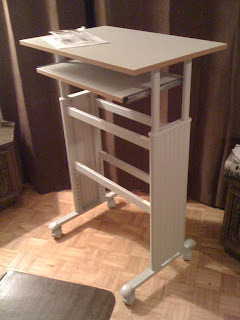 Away I went on the internet searching high & low for a cart that will hold everything (tower, printer, monitor, keyboard, & mouse), be portable, compact, & NOT cost a fortune. 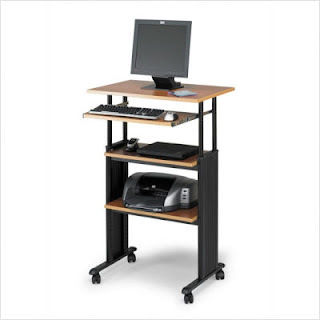 Eventually I found the Safco MUV adjustable height computer workstation. Well it arrived today! I unpacked it and put it together (90%) when I got home in about 1 hour. All that's left is to put the shelves on the support beams. They will only be secured by double-sided sticky foam .. things (kinda cheap) so I want to make sure the shelves are EXACTLY centre. Which strikes me as odd. The whole thing is VERY sturdy. Then they go and cheap out on attaching 2 of the shelves? What would it cost to add a couple more drill holes and some bolts?